The actual trek to Everest Base Camp begins from Lukla, a charming village set at about 9000 feet above sea level. Over the next 14 days, you'll see the landscape change from pine forests and sparkling streams to a more rocky and bare terrain, with trails filled with snow and glacial moraine. There are rickety bridges to cross, pine forests to hike through, and plenty to see. You'll pass yak caravans, interact with the resilient Sherpa community, and will be greeted by pink-cheeked children from the villages you pass. En route, you'll stop at tea-houses, stop at famous landmarks, and spend nights in tea houses. The Everest Base Camp trek becomes a personal journey for many, and will have a significant positive impact on you. • Spend 3 nights in vibrant Kathmandu. • Fly to Lukla in a tiny plane and land on a perilously narrow airstrip. • Explore Namche Bazaar and ask for blessings at Tengboche Monastery. • Visit the memorials of some of the most famous climbers in the world at Thukla-Dukla Pass. • Experience a thrill of adrenaline when you finally get to Everest Base Camp. 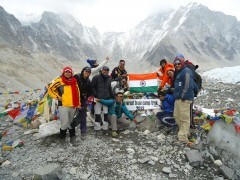 • Climb Kalapathar (5545 m) to witness a glorious sunrise over Mount Everest. 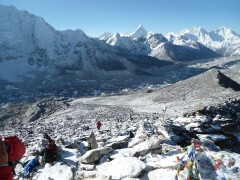 The Everest Base Camp trek is a challenging trek and should be undertaken lightly. If you suffer from respiratory or cardiac conditions, have had open heart surgery, are expecting a child, or have knee or spine problems, the Everest Base Camp trek is not recommended for you. Please avoid alcohol and narcotics on the Everest Base Camp trek. Follow the instructions of the guides during the Everest Base Camp trek, and make sure you rest well during acclimatizing days. Go for a full medical check-up before attempting the Everest Base Camp trek, and do take the medical restrictions seriously. Once booked, ANY cancellations of the Everest Base Camp trek will incur a charge of INR 15,000 per person towards cancellations of Nepal domestic flights, hotel bookings at Kathmandu, and for the Sagarmatha National Park Permit. For cancellations made 0-7 days before the departure of the Everest Base Camp trek: No refunds. For cancellations made 8-15 days before the departure of the Everest Base Camp trek: 25% of the total trip cost will be refunded, minus any transaction charges. For cancellations made 15-30 days before the departure of the Everest Base Camp trek: 50% of the total trip cost will be refunded, minus any transaction charges. The itinerary for the Everest Base Camp trek includes 1 buffer day for the possibility of bad weather and 2 days of acclimatization during the trek. In the case of Force Majeure, extended bad weather, injuries, or illness, provisions can be made for helicopter evacuation. The cost for this is not included in the Everest Base Camp trek package, and will have to be shared by all trekkers if necessary. 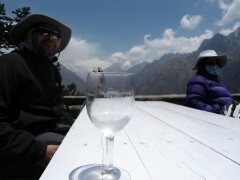 This could cost anywhere between INR 35,000-50,000 per trekker. Do take this into consideration while planning the Everest Base Camp trek. You'll be picked up at Kathmandu airport by the operator and escorted to your hotel in Thamel. Thamel is the most exciting part of Kathmandu, and is filled with restaurants, shops with displays of adventure gear, and delicious food. You'll check into your room, freshen up, and meet in the common area of the hotel for a briefing session. This is an important session, because you'll meet the rest of your group, interact with the team, and understand the nature of the Everest Base Camp trek. After that, the team will check your equipment to make sure you're fully prepared. If you need to pick up any last minute essentials, Kathmandu is the right place. The rest of the day is yours to spend as you please. Overnight in hotel in Kathmandu. Today you'll board your flight to Lukla. The tiny 20-seater airplane weaves between snow-capped mountains and over Solukhumbu's green valleys, and lands at Tenzing-Hillary airport. It's a white-knuckle landing, with landing strip on the top of a cliff, with a runway that is 30 metres wide and 527 metres long, with a steep drop into the valley at the end of the strip! At Lukla, you'll eat breakfast and meet the team of Sherpas and the yaks that will carry your luggage for the rest of the trip. After that, you begin your trek to Phakding. At Phakding, you'll enjoy a peaceful evening with spectacular views. Overnight in tea house. After warming up with the short trek yesterday, you'll set off today on the longest day of the climb. You'll ascend to Namche Bazaar, climbing alongside the Dudhkosi river for most of the way. There are suspension bridges to cross, forested paths to hike along, and massive carved Mani stones and colourful Buddhist prayer flags fluttering in the breeze. Namche Bazaar is the gateway to Mount Everest, and you'll be delighted to explore the narrow lanes with shops, and try out the food here. This is the last spot to buy anything you might need: basic medicines, snacks, or toiletries. Overnight in tea house. You've spent your first night at high altitude, so today is a day for your body to get used to the thinner air. You'll wake up to snow-capped peaks outside your window, and dig into a hearty breakfast. After that, you'll walk to the Sherpa Cultural Museum, where you'll learn about the history of the region and its people. You'll also learn a lot about the local flora and fauna that you'll see on this trek. From the museum, you'll get spectacular views of the Himalayas. If the weather is clear, you'll also be able to get your first glimpse of Mount Everest. You'll be hitting the trail again today, and it's going to be fabulous! You'll be able to see Mount Everest ahead of you all day (if the weather is clear), and that's the best motivation of all. You'll be trekking through gorgeous rhodendron forests, under the shade of the trees around, and up to a carved gateway welcoming you to Tengboche. This is where the largest gompa in Khumbu is located, where you'll be attending the prayer ceremony of the monks of Tengboche Monastery. The Lama of the monastery invokes blessings of the Gods to keep you safe on your expedition to Everest Base Camp. Overnight in tea house in Tengboche. You'll be walking through some very fairytale-like landscape today! The route to Dingboche takes you over wooden bridges over clear streams, amidst the mountains and along pine-scented trails. By the second half, the landscape begins to change, with the ground under your feet becoming more and more rocky. It's going to start looking a lot more like Everest Base Camp than just any other trek. This is also the day you'll see your first snowfall. You'll cross a massive iron bridge and enter the sprawling Dingboche. Overnight in tea house. 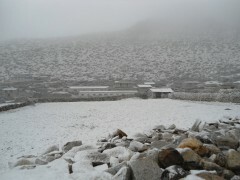 You'll be spending the day at Dingboche today, to give you time to acclimatize to the altitude. You'll do a short hike to a view point called Nanga Karshang, from where you'll be able to to see some of the most technical and difficult peaks to climb: Lhotse, the 4th highest mountain in the world; Manaslu, the 5th highest mountain in the world; and Amadabalam, once considered unclimbable by Everest's famous summiter, Sir Edmund Hilary. You'll return to the campsite in time for a hot lunch, and then enjoy the simple charms of Dingboche: sampling the treats from a local bakery, a good book or a board game beside the warm bukhari in the wooden dining hall. Overnight in a tea house. Today's trek is when you start to realize how difficult the trek to Everest Base Camp can get. You'll be at a higher altitude, with the thinner air and lower temperatures, and you'll probably be walking over glacial moraine. Everest Base Camp is only a day away now, but you'll have to cross a major pass first. It's a tough climb to Thukla-Dukla Pass, but at the top, you'll have incredible views, and the humbling experience of being face to face with the memorials of some of the most famous climbers in the world. Overnight in a tea house. Today's the day you've been waiting for. You'll trek to Gorakshep where your campsite is set up, just before Everest Base Camp. You'll feel yourself slowing down as you cross the 5000 metre/16,400 feet mark today. At Gorakshep, you'll put your luggage into your rooms, eat brunch, and then set off for Everest Base Camp. Each step takes you closer to your goal, and you'll feel the sweet sense of victory soaring! After spending as long as you can here, you'll say goodbye to Everest Base Camp, and head back to Gorakshep. After a celebratory dinner, you'll retire to bed. It's going to be a very early morning tomorrow, and a long day, so make sure you get enough sleep. 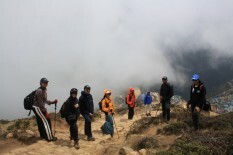 There's an optional trek to Kalapathar Summit today. It means you'll have to wake up at 03:00 a.m, in the bitter cold and dark, but it's going to be absolutely amazing. Kalapathar lies on the south ridge of Mt Pumori, and offers you the best view of Mount Everest. You'll get here in time for sunrise, and it's a moment you'll never forget. The golden morning sun rises over Mount Everest, turning the peaks golden and lighting up the shadows in the ranges around. After that, you head back to Gorakshep, where a hot breakfast awaits you. After breakfast, you'll pack up and begin your return journey, following the same route to Lobuche. You'll head to the scenic Everest trail, the evergreen, yak-breeding village of Periche. You'll be returning to Namche Bazaar today, and you'll enjoy coming back victorious (and a little bit relieved!). You'll also find it more comfortable as you descend to a lower altitude today. The route takes you through the villages of Dengboche and Tengboche, both of which will appear familiar by now. If you have the energy for it, your team can take a detour (involves a few extra hours of walking) to Khumjung Monastery, where you'll be able to see the preserved skull of what locals believe to be a yeti! You'll end the day in the busy lanes of Namche Bazaar, where you can stop at the famous bakery or head to a pub to celebrate the successful completion of your Everest Base Camp trek. Overnight in tea house. Today's the day you return to Lukla, feeling like a champion! You'll be trekking back from Namche Bazaar to Lukla, crossing other trekkers heading up for their Everest Base Camp trek attempt. You'll be able to stop, high-five them, give them last minute tips and tell them what it feels like. There's a long stretch between Phakding and Lukla, but it's nothing compared to the terrain you've already conquered. Overnight in Lukla. 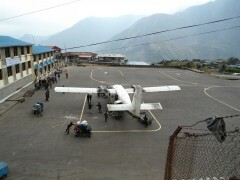 You'll check out of Lukla today, and head to the tiny airstrip to board your plane to Kathmandu. As you climb into the plane, turn around once to say goodbye to the land that hosted one of the biggest adventures of your life. 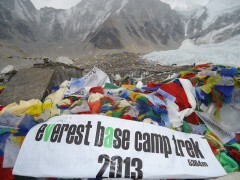 The Everest Base Camp trek is no easy feat, and you've done it! You'll enjoy the 30-minute flight back, looking down over the snowy peaks beneath you, and reliving the many memories you've made on this trek. You'll check into a hotel in Kathmandu, and have the rest of the day free to use as you like. Overnight in hotel. If you encountered bad weather or delays on the Everest Base Camp trek, this is the buffer day which will enable you to make up for lost time. If you're back in Kathmandu today, you will check out from the hotel and begin your journey homewards. If not, you'll be checking in to the hotel in Kathmandu tonight. If you've encountered bad weather en route to Everest Base Camp, you'll be checking out of the hotel today and heading back home. The trip ends here. Layer your thermal wear beneath clothes. Wear a baseball cap or a woollen hat to stay protected from the sun and the cold. Wear gloves and socks to keep your hands and feet warm. • While the operator will be carrying a first aid kit on this Everest Base Camp trek, you should also carry any specific personal or prescribed medication, as well as a personal first-aid kit. Overnight in sherpa lodge/tea house in Phakding. You'll catch the tiny plane to Lukla early in the morning today. 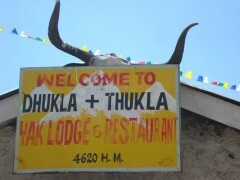 At Lukla, you'll eat breakfast and then meet your sherpas and your yak crew. After that, you set off for the first leg of your Everest Base Camp trek. From today onwards, all three meals are included. 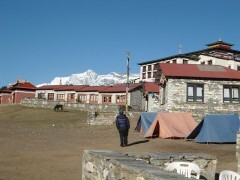 You'll check into a sherpa lodge or tea house in Phakding at night and sleep here. Overnight in sherpa lodge/tea house in Namche Bazaar. You'll do a long trek into Namche Bazaar today and will arrive by early evening. You can buy snacks, medicine, or chocolates and candy for the trek from here. You'll check into a tea house here. Overnight in tea house. Today you spend the day in and around Namche Bazaar, exploring the sights nearby to give you some practice of hiking at this altitude. All meals are provided today. You'll return to the tea house in Namche Bazaar for the night. Overnight in sherpa lodge/tea house in Tengboche. You set off from Namche Bazaar today, heading towards Tengboche. En route, you'll be able to get your first glimpses of Mount Everest, if the skies are clear. You'll spend the night in a tea house in Tengboche. Overnight in sherpa lodge/tea house in Dingboche. The terrain begins to turn arid and stark from the second half of the day onwards. You should see your first snowfall here, and will have to cross a massive iron bridge into Dingboche, so do keep your cameras handy. You'll check into a tea house in Dingboche for the night. Today you'll spend the day in and around Dingboche, giving your body time to acclimatise to the height gain you made yesterday. You'll spend the morning hiking to a viewpoint nearby. You'll return to Dingboche for lunch and then will spend the rest of the day relaxing indoors. Overnight in a tea house in Dingboche. Overnight in sherpa lodge/tea house in Lobuche. 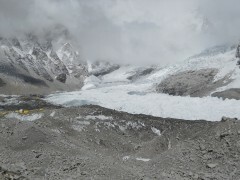 You'll set off from Dingboche today and will head to Lobuche. It's a long trek but it takes you almost up to Everest Base Camp! You'll check into a tea house in Lobuche for the night. Overnight in sherpa lodge/tea house in Gorakshep. It's finally Everest Base Camp day! You'll leave Lobuche and head towards Gorakshep, where your campsite is set up. You'll leave your bags here, eat brunch, and then hike to Everest Base Camp. It's the culmination of days of effort and months of training, and it feels great! You'll return to the campsite in Gorakshep, where tea is waiting for you. You'll be staying at Gorakshep for the night. Overnight in sherpa lodge/tea house in Periche. There's an optional trek to Kalapathar today, which departs at 03:00 hrs in the morning, but will give you spectacular views of the sun rising over Mount Everest. If you choose not to go, you can stay at camp till the others return. After everyone returns and eats breakfast, you'll all retrace your steps back to Lobuche, and onwards to Periche. It's a very scenic spot and you'll be happy to be camping here for the night. You'll descend all the way to Namche Bazaar today, surprised at how easy it seems now that you're going downhill. You'll check into a tea house in Namche Bazaar, and then head out to a restaurant or cafÃ© nearby to celebrate your successful Everest Base Camp trek. Overnight in sherpa lodge/tea house in Lukla. You return to Lukla today, where you'll check into a tea house. It's a long trek, but it's your last day of trekking for the Everest Base Camp trek, so make the most of it. You'll be driven to the aiport today, and will catch a flight from Lukla to Kathmandu. You'll check in to a comfortable 3-star hotel in Kathmandu. After days of sleeping in tea-houses, you'll be delighted to have a soft bed and hot water, but you're going to miss the mountains. Overnight in the hotel. 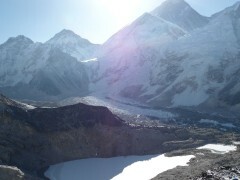 Today is an extra day added to the itinerary, in case of bad weather or delays on the Everest Base Camp trek. If you needed the extra day, you'll be leaving Kathmandu today. Kathmandu has only one airport, but is well connected to most international destinations via connecting flights. 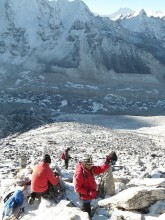 The operator will arrange your transport to the start point of the Everest Base Camp trek.